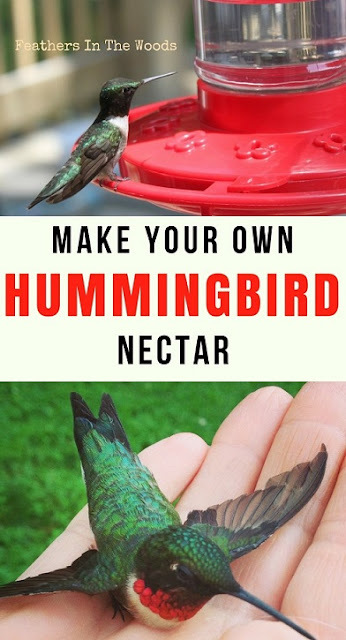 I recently found out that you should make your own hummingbird nectar instead of feeding the store bought red dyed hummingbird food. I had no idea that red stuff was actually bad for them! I wanted to talk about hummingbirds, why they need a more natural nectar and give you that recipe today. They eat an average of 7 times per hour. Hummingbird feet are only used for perching, not hopping or walking. A hummingbird can visit up to 1,000 flowers per day and remembers where they all are! Hummingbirds migrate, some going all the way down to cross the Gulf of Mexico! There was so much more information but those are just a few of my favorites. (for more information check out the hummingbird info website) There was also information about feeding hummingbirds and it suggested that we not buy premade food and instead mix our own about twice a week. I had never heard of such a thing! I always bought those quart jugs of red 'hummingbird syrup' and poured it in the feeder. In my defense, I didn't know better! I thought that's what they were supposed to eat. I found out that the best things for them is simply a homemade mix of sugar and water. No red dye stuff, no flavor sticks to add in (I was buying them mango flavor sticks for their hummingbird juice) just plain sugar and water. It's so simple! Recipe: Dissolve 1 cup of sugar into 4 cups of water. That's it! Pour into feeder and hang in the same spot they're used to it being in. If you have extra you can store it in a closed jug in the refrigerator. (or you can just mix 1/4 cup of sugar with 1 cup of water so there's none left over. As long as you stick to the 1 to 4 ratio, it will turn out right!) As an added bonus, it's much cheaper then the store bought stuff! The red dye is not necessary and may be toxic to their systems. Hummingbirds are attracted to the color red though, so I just buy the red feeders. Never use honey, organic sugar, cane or agave syrup, brown sugar or artificial sweeteners. They contain too much iron, calcium etc and are harmful to hummers! Don't use distilled water, it has all of the naturally occurring minerals removed. Tap water is the best to use. You can also use spring water if you have it. Hang your hummingbird feeder in the shade so that the nectar stays fresh longer. Hummingbirds aren't very afraid of humans so you can hang a feeder outside your window and they will visit it and let you observe them! Don't move the feeder often. They remember where every source of food is so when they don't find the feeder, they won't look around for it they'll just move on to the next place they know food is. .....Which is a good reason to place your feeder near flowers. 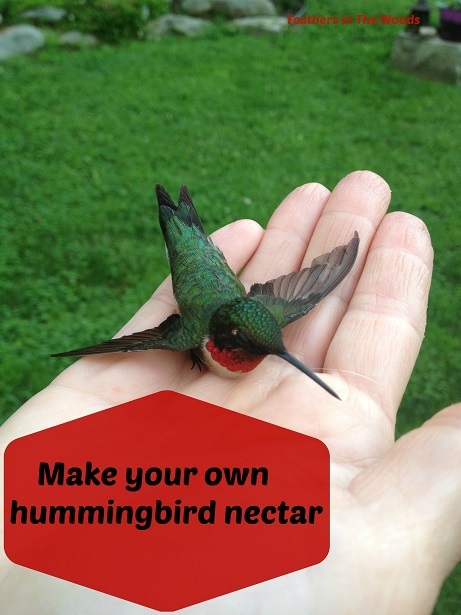 Hummingbird nectar only lasts a few days before it needs changed. Change your nectar every 3-4 days to prevent fermentation. When the sugar starts to ferment it can get the hummingbirds 'drunk' causing them to fly into windows or other things causing injury or death. If the feeder is too dirty and needs cleaned, I use denture tablets since it's hard to reach inside. Click here for details. Just make sure you rinse well after! I live in Pennsylvania, so its time to put out our feeders for the season. Florida starts to see hummers migrating north as early as January while it may take until May for them to get up to the Great Lakes area. It's a myth that hummingbirds won't migrate if feeders are left up too long in the fall. The migrate according to daylight hours and hormones, not food availability. Try to get your feeders up a week or so before when the hummingbirds are expected in your area. Hopefully they'll see your feeder as they buzz by and decide to stop for a drink, and they just may hang out and visit you for the summer! Edited: I have received a few messages asking me why/how I'm holding a hummingbird. The answer is in the post A very special dinner guest from 2 years ago. It is the story of how this hummingbird came to land on my porch and what happened after. Enjoy! Great post. I also live in PA and we will be putting up our feeder very soon. I didn't realize that you weren't suppose to use organic or cane sugar. Thanks for that information. They are wonderful little creatures aren't they. Visiting from Homestead blog hop. Shared! I hung our feeder last week. Love it that all it needs is sugar and water and you give good pointers for not messing with ratio. I agree about the red dye - why risk it. Another trick - I found accidentally last year - is strawberry plants. I hung 3 pots and the hummingbirds found them and kept coming. The caveat is that other birds like the strawberries too and may scare the humminbirds. I need to get my feeder out for the year. We recently moved, I hope they got my change of address card, lol! Thanks for share this recipe with us, I am sure it is much better then the storre bought stuff. We would love for you to share with us at Party in Your PJs, our weekly link party. I love Hummingbirds, we have planted flowers to attract them. We missed hanging our feeders the year that I was really sick and the Hummers would fly to where they used to hang, I had no idea that they remembered where food was, that is so cool. Thanks for sharing that. I will get the feeders cleaned and hung ASAP. Don't want to lose my Hummingbird visitors! I love my hummingbirds. I put out my feeders and had them in less than 5 minutes! Thank you for sharing at the Thursday Favorite Things Blog Hop! Mine did the same thing this year! I just love watching them! I love to watch the hummingbirds eat and I also make my nectar as you do. Yesterday was the first time I've seen a hummingbird this season. Thank you for sharing with the Clever Chicks Blog Hop! I hope you’ll join us again next week! What great tips! We love watching the hummingbirds especially when they feed from the flowers right outside the living room. Thanks for linking up the Country Fair Blog Party. I do hope you will join us again! Isn't that the greatest? I watched one feeding from a flower the other day, and it the flower was no bigger then a dime! I was fascinated! I'll see you at your next blog hop! We've always just made our own. Never knew that you could buy it. I was doing the right thing and didn't even try. lol! I enjoyed the facts that you shared. Thanks for sharing with SYC. Yeah, the store shelves are lined with this bright kool-aid red concoction! I never knew you could feed them anything else till I saw a fact sheet on hummingbirds! I'm so glad I switched! Thanks so much! I'm so flattered! I just loved your themed blog hop! Thanks so much Angie! I am so very flattered!